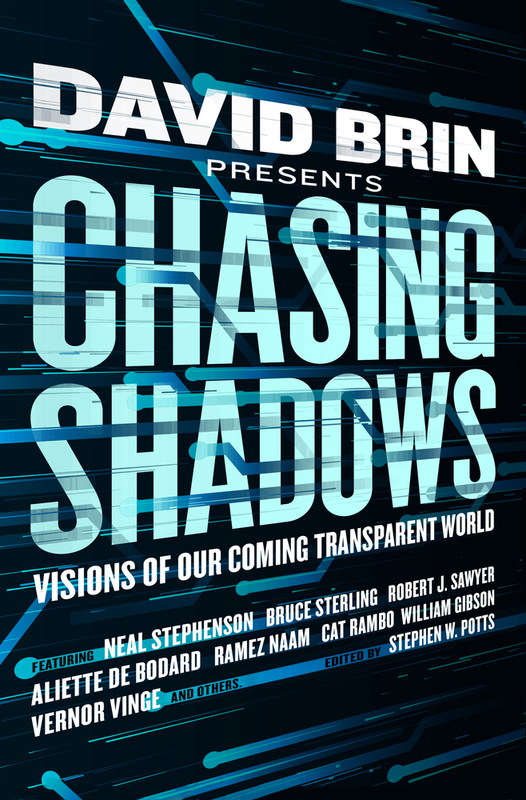 "Chasing Shadows: Visions of Our Coming Transparent World," edited by David Brin and Stephen W. Potts, published on January 10, 2017 by Tor. Age of Transparency or the End of Privacy? The theme of this anthology is what effect information transparency will have in the near future? Authors explore various degrees of transparency, ranging from futures where almost nothing can be hidden from anyone to ones where there’s a good deal of opt-out, and others where not everything is as open as it’s supposed to be. As anthologies go, this one is unusually cohesive. The authors almost all stuck very close to the intended theme. We only reviewed the sixteen stories which are original to this volume. Beyond those, there are nine reprints and four non-fiction essays (counting the introduction) for a total of 29 written works. Of those we reviewed, we recommended 3 (one better than average) and recommended against 3 (also one better than average). Eminence, by Karl Schroeder, tells how the creator of a successful online currency faces the possibility that hackers may bring the whole thing down, ruining him, his family, and his friends. The surveillance angle in this one is subtle but very effective. Eyejacked, by David Walton, deals with voluntary surveillance. A man comes to see his wife’s success as an online personality as a threat to their family because they have almost no privacy. Public Domain, by Scott Sigler, explores the situation where a high level of surveillance is standard and is available to everyone, but not everyone is clever enough to make use of the data. In this story, a young man fears his girlfriend is cheating on him, and he resorts to online data to see what she’s up to.